With the BF away for a few days, life at home has become a tad boring. This weekend is worse! I mean, not that we did something groundbreaking when he was here, but its just that it was easier to while away the day . He would laze around the day, the kids would sprawl all over him and I would have time on my hands to ….well, do some darning or cleaning or shopping( yeah , yeah! that is how I entertain myself these days!). The kids were missing their father terribly, so I gave in and allowed them to watch cartoons for longer than their ration. And, in order to give them a break from all that television, I gave them some plastic beads and satin cords to make into necklaces. It is an easy activity and it helped keep them occupied without my interference. Lui grumbled all along because apparently, I didn’t have the exact bead colours and shapes that fit the pattern in her mind 🙄 . She couldn’t believe, quote- “are you kidding me? You didn’t buy green beads? !”-unquote , that her mother was careless enough to not buy green and pink beads. 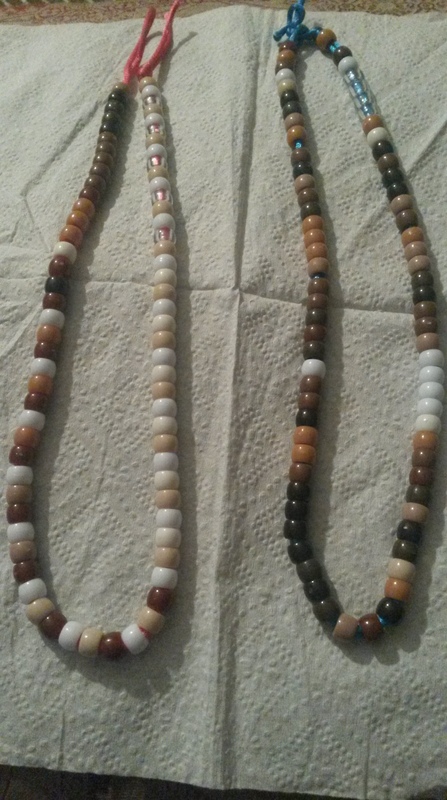 Anyhow, the beads were strung and the Lui proudly wore it around her neck. I asked Shobby to do the same. “No Mom, when I get married, I will give it to my wi-“, he broke off. “Errr……Whom are you going to give it to?”, I pestered, because obviously, I wanted to know whether I heard it right. “I’ll wear it Mumma. On my shaadi“. “But you said you wanted to give it to someone”. “Oh-ho Mumma. You keep this”, he finished the topic by firmly wrapping my fingers around his necklace and scampering away to the bedroom. I sat there for a long while, digesting the fact that my 5+ year old just made a necklace to gift his future wife. Am glad to be back too Sanika. By the way, I’m on Lasalle and I visit Devon often for groceries. And your comments are exactly why I came back! :-D… Shobbs is too sweet. What’s even sweeter that he didn’t complete the sentence. Lol! He was embarrassed??? Lord! Is there anything these kids don’t know already! As for Lui … aren’t you glad she wasn’t happy sticking with pink beads? Green is good.